I’m getting in touch with my crafty side. The Boy loves crafts, and I’m sure that when she’s old enough to understand a bit more (for now she just thoroughly enjoys playing with the yarn) she will too. We do a lot of Waldorf-inspired and free-craft style art. The Boy loves to paint. That might actually be a bit of an understatement. Regardless, he loves to be creative, much like his mama. The difference is that I can follow instructions, but being incredibly creative off the top of my head is not exactly my forte. But, I have to say that I’ve surprised even myself these last couple of days. The Husband got me a knitting book for Christmas and so far I’ve knit 2 pairs of fingerless gloves (one for me, one for his poor cold typing hands) and tonight, I outdid myself. 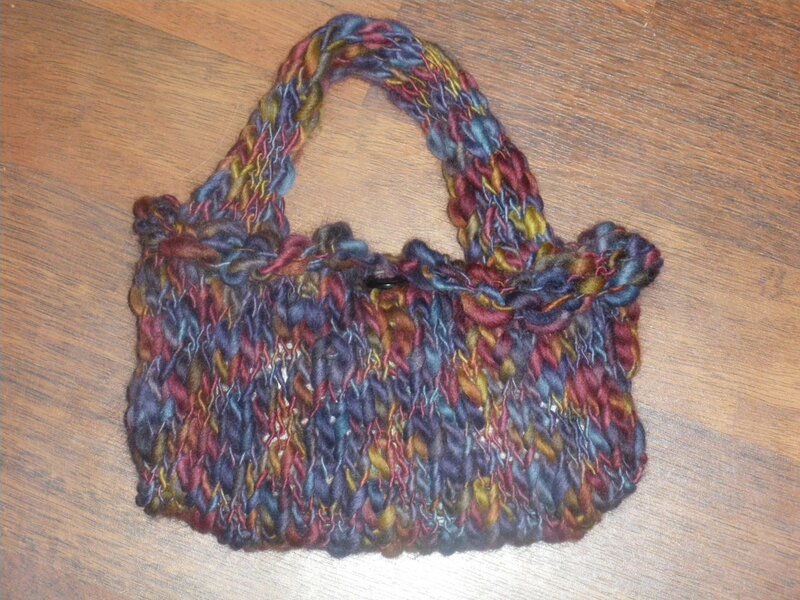 I knit myself a purse. First of all, the wool it is knit from is amazing. I was hugging this wool in the store so I figured I should probably pick it up. And then I knit. And what followed was the purse at the top of the page. I’m also quite impressed with my celiac diet to date. I’ve been eating fantastic foods and tonight I discovered that I can still eat Doritos. To be honest, that was a huge highlight for me. I adore Doritos and love being able to indulge once in a while. It was going to be quite sad for me not to be able to eat them anymore but alas, they are on the safe list. If you’re ever looking for brands pretty quickly, you can always check http://www.penny.ca/ – on the left hand side they have a section for GF safe foods by brand which is a quick and easy way to see if something is okay to eat. Hence how I found the Doritos. Of course, I’m eating a lot more healthy already. I’m quite excited for tomorrow’s breakfast – I’m going to have a peach/mango smoothie. Yummerific. If this is what gluten-free is all about, I’m there. It’s been but 3 weeks since I’ve been diagnosed with celiac disease, and it’s a learning experience every day. I managed to make it through Christmas without gluten (i think) and I even enjoyed the food. It’s still hard some days, but I’m getting the hang of it. Now if only the Boy would understand that when I can’t eat something he’s trying to feed me, it’s not because I’m allergic to nuts (but then he’s 2, and he’s allergic to nuts, so he assumes that everyone who can’t eat anything must be allergic to nuts). Getting diagnosed was a bit of a whirl-wind.. from an initial self-diagnosis, to a blood test confirmation, to a scope confirmation all within a very short period of time, all just before the holidays where food is the basis for every gathering. So far I’ve managed by eating veggies, cheese, fruit and some cheesies. Who knew cheesies were GF..
And now gearing up for New Year’s, I’ll make sure to get my own dip-dishes to avoid that horrible cross-contamination, bring something to the festivities, and just hope against hope that I don’t screw up. who knew that going GF was such a learning experience..